What is Vetmedin used for? Vetmedin capsules 2.5mg are used to treat dogs with congestive heart failure caused by dilated cardiomyopathy, which is when the heart muscle becomes weakened so that it does not pump efficiently and can lead enlarged heart and leaking valves; or mitral valve disease (or endocardiosis), which is degeneration of the heart valves, causing them to become leaky. Vetmedin widens the blood vessels to and from the heart, reducing the workload of your dog’s heart and the force needed to pump blood. Some breeds are more susceptible to congestive heart failure and Vetmedin may help prolong the life of your dog. Vetmedin capsules 2.5mg contain pimobendan, which is a positive inotropic drug meaning that it acts directly on the heart muscles to increase the strength of muscular contraction, by making them more sensitive to calcium, which is needed for muscle cells to contract. Vetmedin 2.5mg also acts on the blood vessels to and from the heart causing vasodilation (widening), which reduces the pressure on the heart and helps it to pump more efficiently. Vetmedin capsules 2.5mg contain the active ingredient pimobendan, which sensitises the heart muscles to calcium, helping the heart pump more efficiently and reducing its workload. 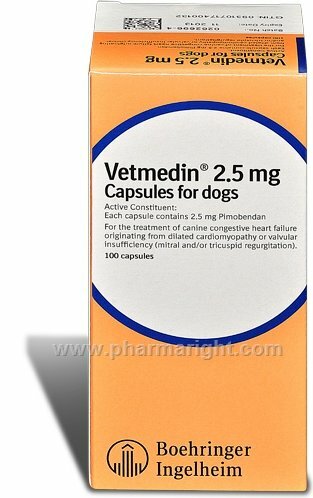 Vetmedin capsules 2.5mg contain pimobendan, which sensitises the heart muscles to calcium, to increase the strength of muscular contraction; and also acts on the blood vessels to and from the heart causing them to widen (vasodilation), which reduces the pressure on the heart and helps it to pump more efficiently. Vetmedin 2.5mg is used to treat dogs with congestive heart failure caused by mitral valve disease (endocardiosis), due to degeneration of the heart valves, causing them to become leaky; or dilated cardiomyopathy, in which the heart becomes enlarged and cannot pump efficiently. Some breeds are more susceptible to congestive heart failure and Vetmedin may help prolong the life of your dog. Vetmedin is well tolerated by dogs, but occasionally, dogs may experience vomiting although this is very rare. How should Vetmedin be given to your dog? You should give Vetmedin capsules 2.5mg orally to your dog twice a day, one hour before food, preferably morning and evening, with approximately 12 hours between doses. The dose you give your dog should be as recommended by your vet and is usually 0.2mg to 0.6mg Vetmedin/kg bodyweight per day. You should see an improvement in your dog’s health within a week but you should continue to give Vetmedin to your dog as long as is recommended by your vet, which may be for the rest of your dogs’s life. Your vet may also recommend other drugs for treating heart failure as well as Vetmedin, as there are no interactions between these drugs. If you miss a dose of Vetmedin capsules 2.5mg give it to your dog as soon as you remember, unless it is time for the next dose, then skip the missed dose. Do not give your dog a double dose.